Have you changed your app title yet? We all know the iOS 6 changes made app store discovery that much more difficult and made app store optimization that much more important. The card system just doesn’t expose as many apps as the old lists used to – so what have you done about it? If you’re a lot like our customers, you’re checking into keywords, tracking your search and category rankings, and trying to leverage as many things as you can in the app store. But have you changed one of the most heavily-weighted factors in app store search – your app title? About two and a half months ago, we ran an analysis looking to answer whether including keywords in your app title was correlated to a ranking increase for that keyword in search in the iTunes app store (iPhone only). 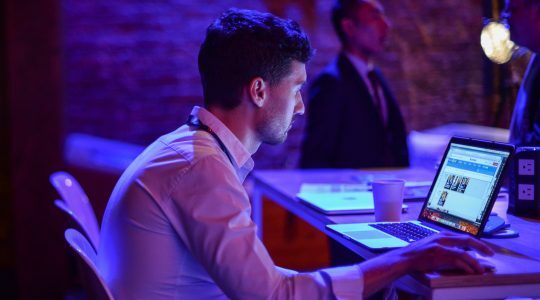 Using a representative sample size of keywords (we’re tracking over 525,000 of them), we looked at the top 25 search results for each keyword sampled. Of those top 25 results, how many had the keyword in the title, what were their ranks, and how many didn’t, and what were their ranks? The results were along the lines of what we’d assumed, but significant nonetheless. Of the apps included in the sample – across all categories – only 16% had the keyword in the title (in any form – singular or plural). Only 16%! And what was the ranking difference between those with the keyword in the title compared to those without the keyword in the title? 15.2%! Apps with the keyword in their titles had a ranking, on average, 15.2% better than those apps without the keyword in their title. While we can’t say including a keyword in your title will necessarily cause your app to climb in the rankings, we did see a heavy correlation. That was 2.5 months ago. Has anything changed? Resoundingly, yes. It seems the app ecosystem has shifted strategies and is, more and more, taking advantage of app titles. 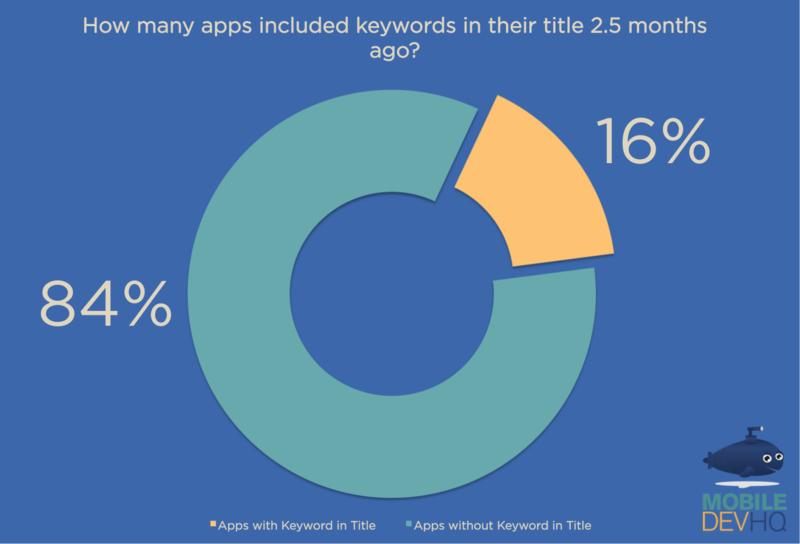 Based on our second running of the same analysis, 51% of the apps sampled have keywords in their title. Intuitively, the more apps pursuing the same strategy, the less effective the strategy, right? 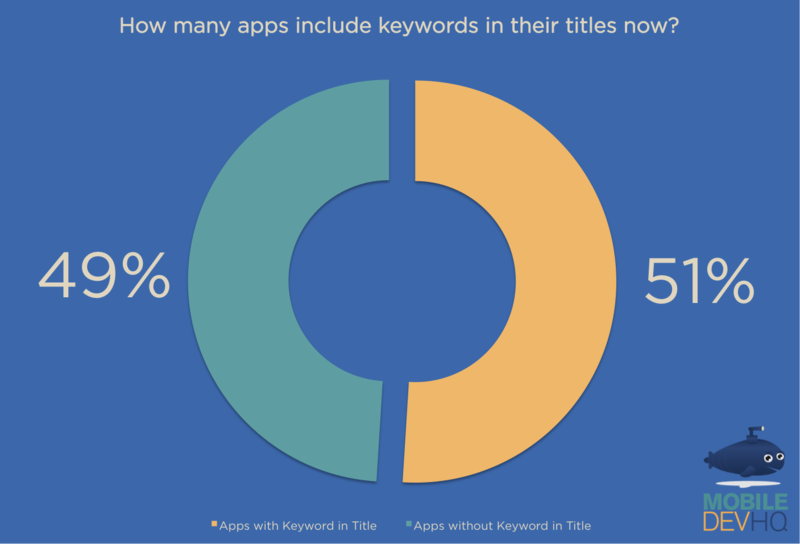 Now, apps with keywords in their titles rank, on average, 10.3% higher than apps without keywords in their title. Since our first analysis, it’s dropped in its effectiveness, but not so low that it’s no longer worth it. 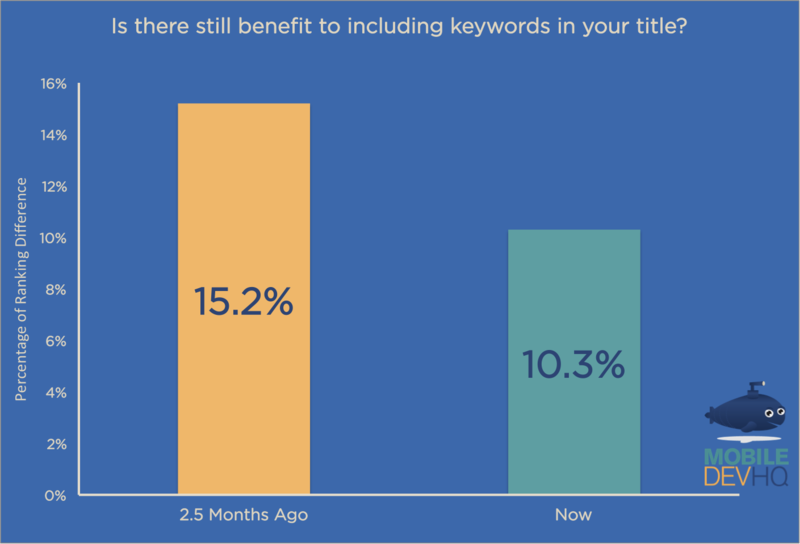 Including your most important keywords in your app’s title can still lead to a ranking jump – it’s hard to argue with a possible 10% ranking increase. 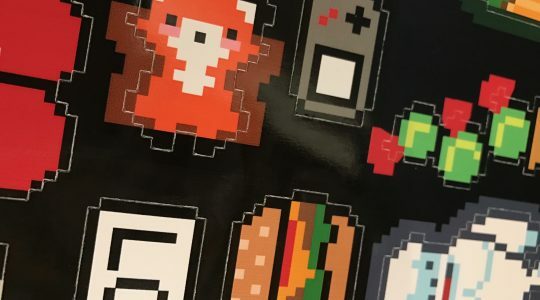 A ranking increase (and the subsequent downloads that come with that increased exposure) sounds nice, but you may be asking: what about branding concerns? This is a completely legitimate question and one that we often get from our customers and clients. An app’s (or a publisher’s) brand is important and can be really helpful in conveying dependable quality and converting potential users. However, your title – in iTunes – can still maintain branding while targeting keywords. For example, Zillow is targeting “real estate,” “homes,” “apartments,” “for sale,” and “rent” in its title. Do these keywords obscure the brand or interfere with their branding strategy? I would argue they don’t. First, the title is truncated, which helps as searchers will only see the first half or so of the title – exactly where the branding will be. No one really has to see your title’s keywords as they search until they click into your app. I would argue that, at that point, the title’s job is over and the description, icon, and screenshots take over. Your title has put in its time: it helped the app show up for those important keywords, it got eyes on your app, and it helped to textually explain what the app is all about up front, thus helping convert some potential users from the card list to your app’s page. Second, your icon and first screenshot overwhelm the screen real estate (pun intended) and are really what draw in the potential user. These are the most important branding tools in the app store. 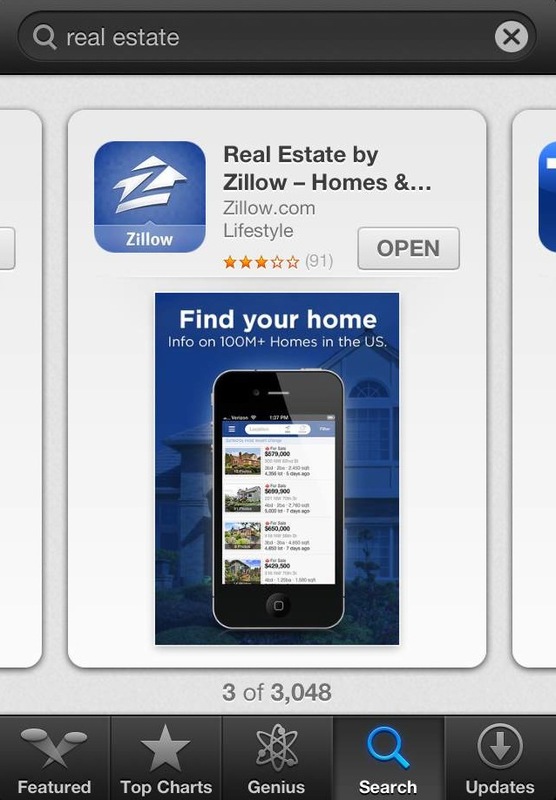 In Zillow’s case, their icon is immediately recognizable and their screenshot gives a glimpse of what’s to come. I’m likely to download the app based solely on the icon (i.e., the fact that it’s Zillow) and the first screenshot (i.e., a visual display of what the app can offer me). The title really doesn’t factor into it too much. For those apps that are app-only businesses, with no external business and no non-app brand to cultivate, this still holds water. Use your icon to include your studio/company logo along with the app’s unique icon. Go crazy with that first screenshot – like the icon, integrate your company’s brand with the app’s brand. Make the app synonymous with your company – whether you’re a studio, game firm, or an indie developer. If it’s quality, then you’ll be known for quality. Third, your branding is all about setting the expectations about your brand’s value prop. This is where the details come in – your description and your full set of screenshots. These are the most important assets in developing and establishing your app’s brand. Based on not only the content of your description, but also how it’s written, I can tell whether I’m going to enjoy this app and whether its brand resonates with me. Is the copy light and, though brief, enjoyable? Or, is it rigid and robotic? From an app’s screenshots, I can tell whether it offers the functionality I’m looking for in an aesthetically and user-friendly way. 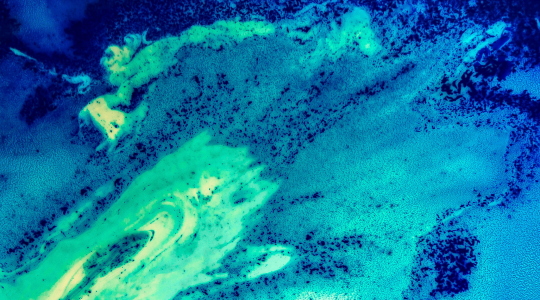 Still not convinced of the potential benefits of a title change? The pre-change title and keyword set were not targeted towards game users relevant to survival simulation. The title was vague and did not include any game genre-related keywords; in fact, it included no keywords at all. We recommended an app title change and a keyword set change. We based our recommendations on search volume, ranking difficulty, genre relevance, and audience type, and recommended he include 1-2 ”head” keywords in the title. The download increase was significant. 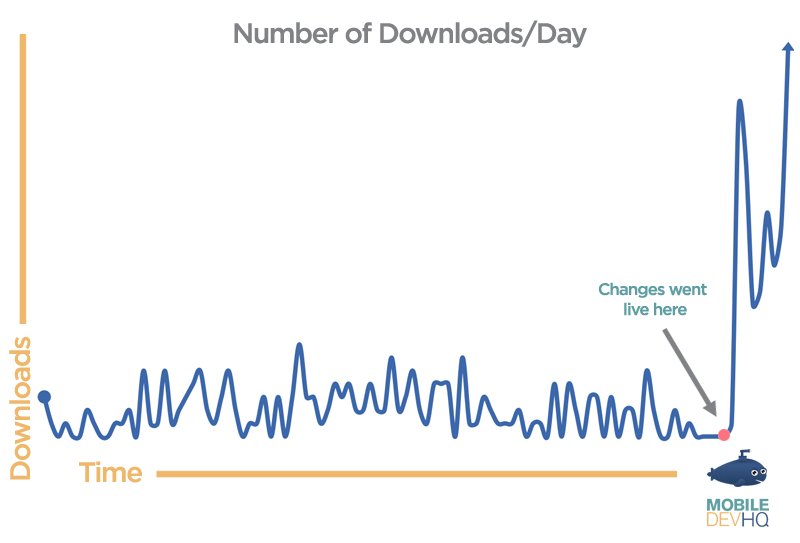 Once the changes went live, his app saw a 9X increase in his average number of downloads per day. The increase was also sustained throughout the duration of the case study. Leverage your title while there’s still benefit to be had. The increase in exposure will get more eyes on your app(s) and allow your icon, screenshots, and description to do the rest of the work. If you’ve been careful and diligent with those assets, you shouldn’t be too worried about your title muddying your brand because it very likely won’t. Patrick is a Product Manager on the App Store Analytics team at TUNE, the leading app attribution and analytics company based in Seattle, where he focuses on building the best product to help mobile marketers increase organic user acquisition. He was previously the VP, Customer Success at MobileDevHQ, which TUNE acquired in August 2014.